I was in one of the bookstores at Ogilvie this morning buying yet ANOTHER umbrella (because the light sprinkle when I walked out of my apartment was not enough motivation to go back inside and get one but of course turned into a monsoon. Of course.) when I walked by the latest Tucker Max book – Sloppy Seconds: The Tucker Max Leftovers. Okay, FIRST of all, NO. Second of all – really? When I first moved to Chicago, my roommate lent me I Hope They Serve Beer in Hell, which I thought was hilarious. I think in between he’s also written Assholes Finish First (sadly true), and Hilarity Ensues, neither of which I had read. Except: no. No I am not. I haven’t slept with THOUSANDS of people, I haven’t fucked a dude in a port-o-potty, I haven’t been banned for life from the Embassy Suites for shitting in the lobby and I certainly have not gone out with my friends with the intent of getting into fights, arrested, or to see who could make the most people cry. I’m not saying he shouldn’t have written three books (though the movie was of questionable judgement) – they’ve obviously sold well. I just cannot possibly compare myself to him (not that I SERIOUSLY was). 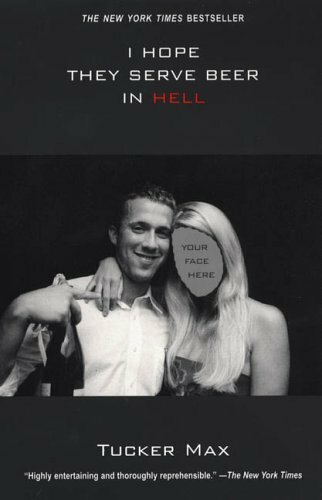 I doubt my book will sell that well…or at all…or get published so that’s another reason I’m not the female Tucker Max. The worst part of this is that now I’m probably going to read his other books out of morbid curiosity. Sigh.